Are you looking for the best bookshelf speakers under 100 dollars for a vinyl record player, TV, home theater, or a big room? Ones with a small and solid build that can provide an appreciable sound quality to an audiophile or beginner? These speakers have a wide range of frequency response to support low, mid, and high frequencies and in the end, high fidelity sound is produced. You can place them on your shelf or windowsill, mount them on the wall, and even use them as a replacement for your computer, laptop, or gaming speakers. Besides, you can sit back conveniently on your couch while you control its playback, mute/unmute, and play functions using its remote control. And all these go for a whopping 100 bucks and even less. If you can spare the change, then you can enhance the audio entertainment in your home. Previously, we reviewed the best bookshelf speakers under 100 pounds on Amazon, but due to the fact that the price of some products on Amazon UK varies from that on Amazon US, we've also thought it wise to round up the best bookshelf speakers under 100 dollars. This will allow you to get a machine at your most preferred price without having taxes and shipping expenses amount to it. Nonetheless, compare between both selected products in our guides to see which works best for you and then purchase it from your favorite online store right from the US, UK, Canada, Australia, and any other country. How Do Bookshelf Speakers Work? How Were These Bookshelf Speakers Selected? A bookshelf speaker is a small cabinet whose components allow it to convert an audio signal to an electric current which is then amplified to give a loud sound. Some of these components include a woofer (large driver unit), tweeter (small driver unit), subwoofer, built-in amplifier, etc. For this reason, it is a standalone system that needs to be paired with other devices for its full functionality. Accordingly, these speakers can be used with record players, Laptops, Smartphones, DVD players, Bluray, and several other music players. In each case, this is made possible by connecting the audio source to its back panel RCA/AUX inputs using a cable. On top of that, the best bookshelf speakers with Bluetooth will allow you to stream music from your Android, iOS, Windows or Mac OS device which will be played through the speakers. There are two major types of bookshelf speakers, and mostly all speakers in different designs are of these same types. They are the passive or non-powered speakers and the active or powered speakers. That is to say, whether it is a bookshelf speaker, desktop or computer speaker, monitor, in-wall, or ceiling speakers, you'll find them categorized into passive and active speakers. Let's break each element down. Passive bookshelf speakers do not come with a built-in amp. As a result, you must already own an amp or stereo receiver before you can use them or you may have to buy one alongside your new speakers. What the amp does, is to supply power to the speakers which will enable them to stay powered. Therefore, the connection setup you'll have in the end will be your audio source connected to the amp and the speakers connected to the amp. The type of amp you match to your speakers can determine the quality of sound produced. Thus, it is important to know how to match an amp to a bookshelf speaker to get excellent sound quality and also prevent your speakers from getting damaged. This is the measure of the power supplied to the speakers by the amp. Here, it is a good principle to buy an amp that has a wattage power that is in the same range as your speaker. The reason for this is, when the amp is underpowered, it can cause speaker distortion where the sound produced will be affected. Contrarily, an amp that has a power wattage higher than that of your speaker might blow it. If you don't want that to happen anytime soon, then you'll stick to this principle. This is known as the resistance of a system to an electric current that is flowing through it, and impedance is given in ohms. In practice, this is an opposition by the speakers to the current supplied by the amp. It is usually advisable that you use an amp whose impedance is less than or equal to that of the amp. An amplifier tends to use its lowest possible power. To ensure it uses it fully, you need to use a speaker that has at least twice its impedance. Let's not bore you with the jargon, here's a simpler explanation. You have a 4 ohms amp with a power wattage of 100Watts and it is powering a speaker of 8 ohms, then it'll tend to use only half (50 watts) its power for the supplied load. Alternatively, you can make it use its power, fully (100 watts) by connecting it to two 8 ohms speakers. Sensitivity is measured in decibels and it describes how loud your speakers will likely get. A low sensitivity which is less than 98dB will make the sound very loud in the room, but not go beyond it. In the same vein, one with a high sensitivity will make the sound loud enough to be heard in the adjoining rooms. That being so, if you want the best bookshelf speakers at low volume or for a big room, you should have a picture of the type of speakers you'll get. The best bookshelf speakers that are active come with a built-in amplifier. As a consequence, you do not need to buy an external amp to power it. Plug it into a smartphone, TV, PC, Mac, DVD player etc and it'll be ready to play immediately. With these in mind, you'll find more active speakers when it comes to bookshelf speakers, while there are more passive speakers. How Do These Speakers Work? Bookshelf speakers mostly come in pairs where one of the speakers may be an active speaker and the other, a passive speaker. They are lightweight, less bulky, and have inexpensive drivers that help to amplify sound. The drivers are mainly of two types which are the woofers and the tweeters. The woofers generate a low-frequency sound which is bass, while the tweeter generates a high-frequency sound which is treble. These speakers may come with a built-in amp or rely on a stereo receiver before they can play music. You'll find ratings such as Hertz, watts, impedance, sensitivity, and frequency range as part of these speakers, and each determines how well the speaker can work. There are several speakers you'll find out there and even wireless headphones that may promise higher sound levels. Whether it's an affordable bookshelf speaker or one with a high price you settle for, these are generally devices that have a compact size. They do not take so much space irrespective of where they are placed and as such, keep them on a shelf, speaker stand, or mount them on the wall and they won't get a lot of attention. The best bookshelf speakers promise absolute sound due to the airtight build which makes them produce better audio quality. Since they're 2.1 systems specially designed for home entertainment and not only gaming and PC as in the case of desktop speakers, they are a better alternative. Moreover, if you want a speaker suitable for a small room, then this the type you'll go for. Now that you've decided to settle for the best bookshelf speakers on Amazon, you need to be informed on how to choose the best out there. Yes! they are all meant to enhance sound quality, but some do it better than others. 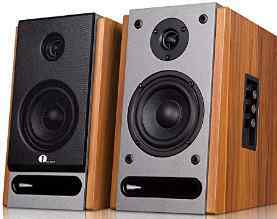 Consequently, if you don't want to rely only on the word of the manufacturer, design of the speakers, and its mouthwatering price, here are a few things you should consider when choosing the best bookshelf speakers in 2018. While this will save you from making unnecessary expenses, you'll also find the best bookshelf speakers in any price range you have settled for. Obviously, there's no use breaking your bank for the best bookshelf speakers money can buy when you can find less expensive ones that can offer a high-quality sound that your ears will appreciate. Most of these speakers come in a small and compact size but then, you'll still find some that weigh a ton or might be a little too big to be inconspicuously placed on a shelf. Nevertheless, if you're not bothered about minute things like this or you don't plan on moving the speakers around every once in a while in order to find the best region for the sound, then you can overlook this. The higher the sensitivity value of your speakers, the higher its volume will be. On that note, you should be looking for speakers around 85dB to ensure that you can get a loud sound that can cover the living room, bedroom, den, or wherever you choose to place these speakers. If you can find a speaker with a sensitivity over 90dB, even better. The lower frequencies (left-hand value) denote bass while the higher frequencies (right-hand value denote the treble. In this regards, if you want a speaker around 100 that is rich in bass, then its low frequency must be as low as possible. You'll find some around 38Hz, 45Hz, 60Hz etc. and these are the kinds you should go for given the 100 dollars price tag you may have in mind. Irrespective of the specifications of the best bookshelf speakers and their features, it all boils down to their real-life operation. With that in mind, you need to take a closer look at what buyers are saying about that particular product on Reddit, Amazon, eBay, AVS forum, and several other sites before dishing out your hard-earned money to buy it. Ever noticed the wide range of brands with low-end, mid-end, and high-end bookshelf speakers on a yearly basis? And how difficult it can be to make the decision of which to settle for? That can be a thing of the past thanks to our guide to only the 5 bests within the $100 price range. If you've been looking forward to this part like we did, then here is a list of the top best bookshelf speakers around 100 dollars that are the best buys for your money's worth. 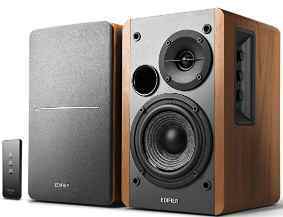 First on the list, and also on other Amazon affiliate review sites, is the Edifier R1280T powered bookshelf speakers. As one of the best bookshelf speakers under 100, these pairs are designed and manufactured by the China-based company, Edifier. These guys have been designing sound systems since 1996 and you'll find devices like headphones, Computers speakers, TV, and home theater speakers as well as Bluetooth wireless speakers from this brand. For about $99, you can walk away with these pair of speakers. But first, let's show you what it offers. Sporting a wooden design at its sides to give a retro look, this speaker has an admirable design. Therefore, if you want something that looks old yet classy enough to fit in between your shelf and your pair of fiction novels, then this would be it. At its weight of and dimension of 6.9 x 9.5 x 5.8 in and weight of 10.8 lbs, it is a very portable bookshelf speaker. This will make it light enough to be moved around with ease and even traveled with if there's need to. The R1280T is a 2.0 speaker system where one of the speakers is a passive speaker that will require an amp to power, while the other is an active speaker that won't necessarily require one. This system can also serve as a studio monitor speaker given its mid-range specs. Moreover, it has a calibrated, flared bass reflex port and a 4-inch bass driver in a bid to deliver high fidelity audio. You can connect it to a record player, PC, Mac, Android smartphone, iPhone and a wide range of devices using a cable. In addition to that, multiple audio sources can be connected at a time to it, thanks to its dual RCA inputs on the active speaker that supports RCA to RCA or RCA to AUX connections. This speaker has a frequency response of 75 Hz - 18 kHz and a closer look at it shows deep bass levels are supported. A small sound cabinet that can deliver rich bass that is full of presence and depth as well as high notes in your songs. On the contrary, if you'll rather personalize the sound produced by the speakers, you can adjust its bass, treble, and volume using the dials that are located at the back of the speaker. To enable you to control the operation of this speaker such as lowering or increasing the volume from a few feet away, there is remote control it comes with. Also, when the speaker is turned on, the volume is automatically set to a comfortable level that is neither too high nor low. 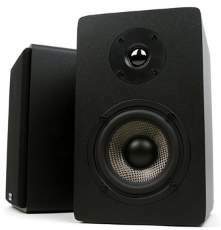 The Micca MB42X bookshelf speakers are another great speakers around $100 that promise good value at an affordable price. Others from this manufacturer and in the same series as are the Micca MB42, Micca MB42-C, and the Micca MB42X-C. These speakers are designed and manufactured by Micca Electronics, a US-based audio systems company that also specializes in the production of digital photo frames, portable personal audio, and digital media players. 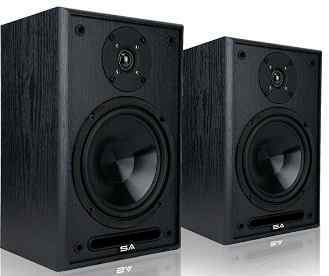 These pair of speakers are available in Black color and they have a solid build that make them stand the test of time. In line with that, you get speakers with a contoured corner to enable it to blend with the design of your shelf. It also has a rear ported, matte black vinyl enclosure to enable it to produce crisp and clear sound. Its Magnetic front Grill System covering the drivers can easily be removed and replaced. At a dimension of 6.5 x 5.8 x 9.5 in and weight of 9.3 lbs, this in-wall, bookshelf speaker can be placed on the shelf, by a corner in the room, on a speaker stand, or mounted on the wall to give excellent sound levels. The Micca MB42X bookshelf speaker is a passive speaker that does not come with its own amp. For this reason, you'll have you buy an external amp or stereo receiver to power it. It comes with a 4-Inch carbon fiber woofer with rubber surround and a 0.75-inch silk dome tweeter to provide decent audio quality. This speaker has a sensitivity of 85dB, which means its volume can be tuned to the highest that will be loud enough to be heard in the entire room. In contrast, the sound might be muffled if listened to from another room while the speakers are playing music. The frequency response range of this device is 60Hz-20kHz which makes for detailed and clear sound. Whether it's the best bookshelf speakers under 100, 200, 300, 500 and even the best record players you need, then 1byone has got a device in either range. The 1byone powered Bluetooth classic bookshelf speaker is offered by an online store that also provides Turntables, Tv accessories, and other smart home electronics accessories. Here's what you should know about this speaker. 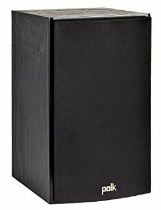 In terms of build, this speaker has a small and compact size which can be attributed to its dimension of 11.02 x 8.39 x 6.14 in and weight of 12.57 lbs. It has a wooden design that gives it a stunning and classy look, making it another worthy member of your bookshelf. There's an LED indicator light that changes to green when the power button is switched. The 1byone powered Bluetooth classic bookshelf speaker has a 4" woofer that is made of a balanced woven carbon fiber. There's also a 1" silk dome tweeter and these drivers help to deliver its sound. You'll also find side panel control dials on this speaker which allows you to control the audio, bass and treble and therefore, finetune the sound to meet your preference. On top of that, this is bookshelf speaker with built-in Bluetooth which will enable you to connect wirelessly to other Bluetooth Enabled device. Accordingly, pair your smartphone, Tablet, Mac, Computer or other Audio sources to this speaker and push in the volume dial to select the audio source, then you can play their audio content through its speakers. There's also an RCA input which allows for a wired connection to audio sources such as DVD players and gaming systems. You can connect your DJ headphone with Bass to it as well. 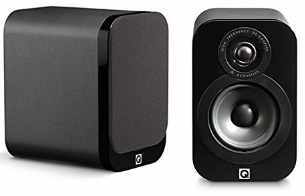 Polk Audio T15 bookshelf speakers come highly recommended not only for its cheap price of $59.98 but its capabilities. It is one of the speakers in the Polk Tseries, the others being the T30 and T50. In all, the Polk Monitor Series loudspeakers are designed by Polk Audio, an audio products manufacturer based in Maryland, USA. You may have come across at least one of their products such as an amplifier, FM tuner, sound bar, marine speaker, car speaker or even a headphone. A quick look at what this particular model offers. These speakers take advantage of an MDF cabinet construction that tends to minimize resonance and distortion. This will help to maintain the sound quality which is a clear and detailed audio sound. The casing has a black polymer veneer, matched by a black mesh speaker grill. We can say that the build is very solid and as such, place it on a desk, bookshelf, speaker stand, or even mount on the wall and it'll be able to deliver high fidelity audio. This is a home theater and music bookshelf speaker that comes with a 0.75-inch silk dome tweeter and a 5.25-inch composite driver to deliver great audio quality. This passive speaker will require a connection to home theater receivers, stereos or home theater processors in order for it to play music. It has a sensitivity of 85dB which translates into a speaker that can provide high audio levels and as such, if you like your music really loud, this one can provide that. On the contrary, the same level of sound might not extend to another room. To supply power to this speaker, you can use an amp with a wattage power of 100watts since this is can be handled by the speaker (20-100 Watts). In addition, its frequency response of 60Hz-24kHz can result in a deep bass. Sound Appeal 6.5-Inch bookshelf speakers are around 100 dollars and so they are one more cheap speakers that won't break your wallet. Here's what their bookshelf speaker offers. To minimize resonance and minimize distortion, this speaker also comes with a ½” MDF for the cabinet walls. What you should expect, is an uncompromised sound quality. For its compact size, it has a dimension of 12 x 7.75 x 7.5 (H x W x D) and weight of 12 pounds which still makes it retain a portable nature. According to its makers, this is in-ceiling, in-wall, or bookshelf speaker, and in consequence, if you don't place it on the shelf, there are several other places you can locate it. You also get a wall mounting hook to make easier to mount this speaker to the wall. Much more, there is a removable grill that gives the speaker a boost in its design and to access the drivers and tuned port, you can take off this grill. The Sound Appeal 6.5-Inch bookshelf speaker has a 1 " silk dome tweeter design and a 6.5” injection Polypropylene cone woofer with butyl rubber surround. It has a frequency response of 45Hz to 20Khz therefore, if the reason you need a bookshelf speaker in the first place is for its rich bass quality, then this one can make that happen. Its nominal impedance is 8 Ohms and that being the case, you can use an amplifier that has an impedance less than or equal to this one. This will ensure that the amp uses its power, fully to carry the load of the speakers and by this, you can get a more enhanced audio quality. On the other hand, its sensitivity of 90dB is quite high and will ensure that you get a high volume level. To narrow down only to the best 5 bookshelf speakers under 100 dollars in 2018, we had to consider a lot of options that will enable us to select the best out there. These are speakers with an appealing design, solid build, and can offer a decent level of audio sound. Price was a limitation to the scope of our research in finding the best bookshelf speakers on Amazon and Reddit. In that case, we had to concentrate only on those either less than or equal to $100. Consequently, each of these is an inexpensive speaker. Since the sensitivity of your speakers will determine how high you can crank up the volume, we had to consider speakers with a sensitivity of at least 85dB and higher. As a result, they can provide quality audio sound in the rooms they're being used. Bookshelf speakers are notorious for their rich bass levels and as such, our selected speakers had to support lower frequencies even as low as 45Hz. On the other hand, you'll find more expensive speakers that even go lower, but for the price of these, they're appreciable ones. To enable you to move these speakers around with ease, our selections have a portable size that will allow you to place it on a bookshelf or mount it on a wall. You can even transport them if need be. Given that there are buyers on Amazon who have also used each of these products and can ascertain their level of operation, it means that their reviews are very valuable. On that note, we also had to rely on the reviews of buyers on Amazon and the recommendations made by users on Reddit. These are the best bookshelf speakers around 100 dollars that can offer great sound quality and at an affordable price. They have built-in amp, Bluetooth, RCA inputs, headphone jacks and several other features that will enhance the capabilities of your speakers. Now all you have to do is to choose a speaker that meets your needs and then purchase it from a reputable online store like Amazon, eBay, or Walmart. You can be entertained in your home, office, or business and that’s all that really matters.